Bunuelos, a sweet dessert or a great snack. 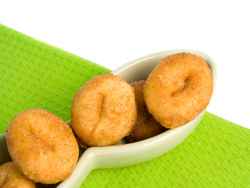 For some fun, try making these little Mexican donuts into different shapes to serve at a child's party instead of cookies. For the topping, combine sugar and cinnamon in a lunch size brown paper bag, set aside. Sift together the flour and baking powder. In a separate bowl, cream the sugar and butter until smooth. Add egg, milk and the masa harina. Gradually add in the flour until a dough forms. Roll the dough into 1 1/2 inch balls or flatten them into cakes. Heat oil in a medium pan until hot. Fry 6-7 minutes or until golden brown. Turning as needed with tongs. Using the tongs, remove to a plate covered with a paper towel. Once slightly cooled place each piece in bag with sugar mixture and shake until well coated.